You are here: Home / From My Experience / White Spot hamburgers have gone too far ! White Spot hamburgers have gone too far ! 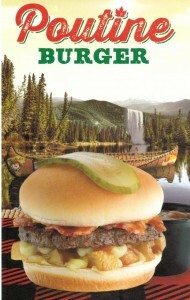 White Spot’s most disgusting hamburger ! In the mail today I received a flyer from the White Spot that caught my eye as I proceeded to throw it into the recycling. I promptly retrieved it from my recycling because I could believe what I was seeing. 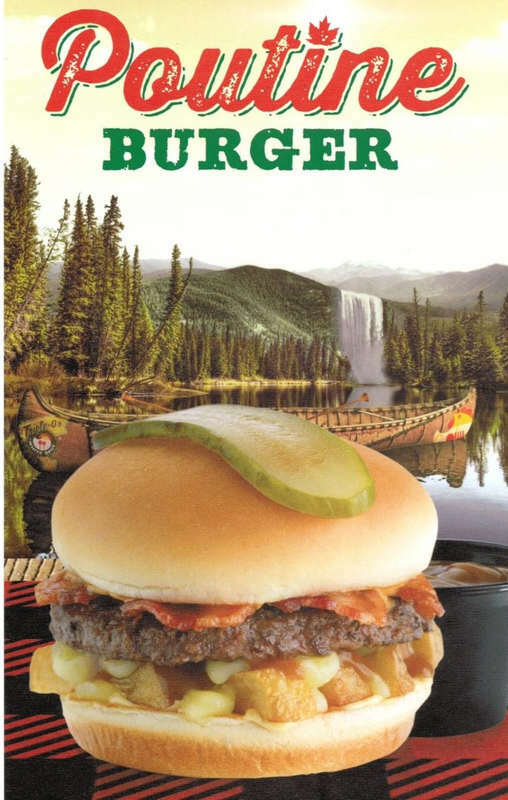 A POUTINE Burger with a Canadian flag dotting the “i” in the word Poutine and what looks like a Photoshopped picture of a waterfall over a mountain range and “Triple O” canoe in the forefront. Supposed looking like the great outdoors of BC no less, like that’s supposed to mean it’s good for you? 100% fresh Canadian Beef topped with bacon, thick cut fries, cheese curds, gravy, with chipotle mayo. Served with a side of gravy! They’ve got to be kidding……this is one of the most outrageous heart stopping, plaque building, waist growing, disgusting hamburgers I have seen in a long time. Really White Spot ? There is nothing in this hamburger that is good for you….load on the bacon, and not just normal fries they are “thick” cut fries, cheese curds?, gravy and more gravy on the side and mayo……this is outrageous! White Spot was founded in Vancouver B.C. in 1928, by Nat Bailey and was one of Vancouver’s iconic restaurants. It had a reputation as having the best burgers anywhere when I was growing up in the 70’s and on the few road trips to the Interior of BC, I have been know to stop in Hope for gas and a Triple O hamburger. But I am really disappointed with what you think we Canadians want to eat…….you really have no idea do you ? It’s 2013, who in their right mind would eat this or feed this to their children. If you really care about your health you would avoid eating at White Spot until they clean up their act. Maybe White Spot you should take a look at what McDonald’s is doing and learn a few lessons.